I am so excited to be Guest Designing for Ellen Hutson's Christmas in July! That's right, I'm on The CLASSroom today with a full tutorial for this whimsical, happy Christmas card! I hope you'll pop over for more details! But before you do - make sure you leave a comment here for a chance to win a $50 Gift Certificate to Ellen Hutson's store! Leave a comment before midnight on Thursday, July 27 and the randomly selected winner will be announced here next Friday! ETA: 12:43pm - I just got notice that Ellen is having a Christmas in July Sale! 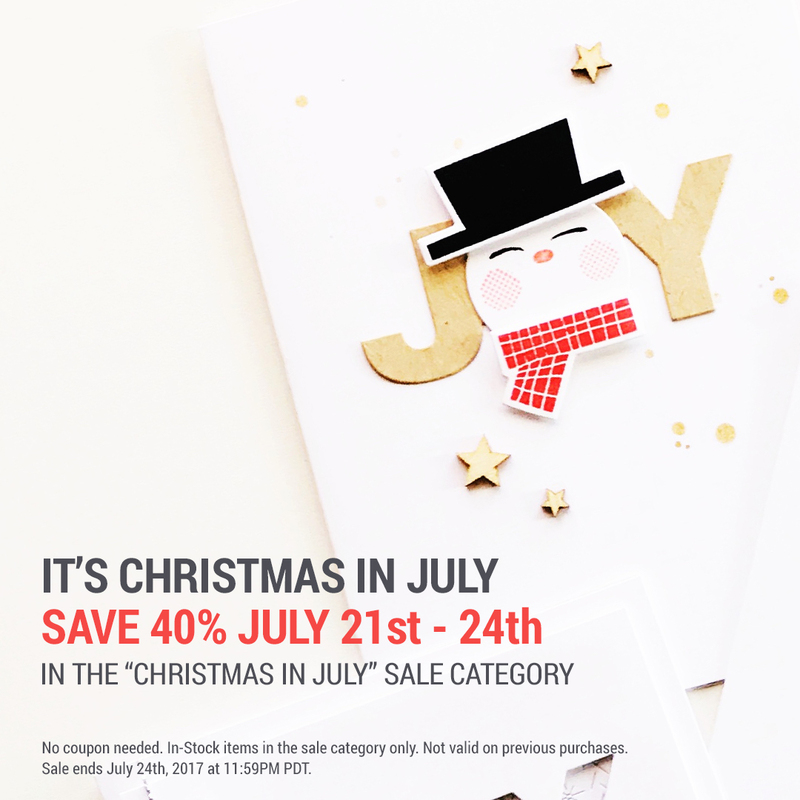 40% off all items in the Christmas in July category until July 24! Hurry and save! Love the style of this card!! Colors are great. Can't wait to make! Off to check it out, the preview looks amazing! Congratulations on your feature in The Classroom. of course I'm going to comment! Love your work Ardyth and will click to check out your latest creation! Thanks for sharing and inspiring! Love your poppin' Christmas creation Ardyth! Congratulations! LOVE your card, Ardyth! So awesome! Love the colors you chose to use. Just back from EH and WOW! Not only is your pink/lime/teal Christmas card gorgeous, but your tutorial is absolutely excellent! From the 'how to' of colouring, to the layout of your design, you've certainly shared fabulous tips and left us feeling wonderfully inspired. Thrilled to see you in The Classroom; you're a fantastic teacher! Congrats on the Guest Design spot. Wonderful card! Crazy to mask all those little lights - but an amazing result! Wow! This card is amazing! I love the background you created out of wreaths. And the masking for the tree lights is unreal! That must've taken a long time! Lol. Love the colors and how it all turned out. Absolutely beautiful! Beautiful card!!! I really like the color scheme!!!! YAY you! So happy to see you over at EH. And what a labor of love! Oh those colors! What an incredible card. Loving the sort of non-traditional colours. Thank you for taking the time to explain how the card was constructed. Yay! I can already tell I'm going to love this and the bright colors you've used! I just saw your fun card, and it and the stamps are terrific! I like the colors you used and your idea to tuck the little sentiment banner in the "O." Beautifully done! Love the colors and the overall fun in your card. Saw your festive card over at EH. Love the vibrant colors and your clever use of the wreath stamp, it makes for a fun background! I can't believe you were patient enough to put little masks on those lights! May I recommend that you think about getting a Molotow masking pen - I think it would be so much easier. Congratulations on being featured at the Classroom today with your bright and cheerful card! So well deserved, too! Love how you created the border! Love the fun card you created! Awesome bright colors, and that tree is adorable! Thanks for sharing your card in the CLASSroom! Terrific card, Ardyth, and your tutorial was helpful and inspiring. Love the colors you used, and the use of the wreath is so creative. Thanks for sharing your great talent with us! Wow! Such a bright and beautiful card :) i love those vibrant colors and that tree image is super fun. I am heading over to the ClassRoom and can't wait to see the tutorial! I love the sneak peek...the colors are wonderful and I love the touch of glitter on the banner. Kicking myself for shopping too quickly yesterday,,I got the JOY die but passed on the stamp sets as I had no idea of how to use them, until now! I LOVE how you made the BG Border with the wreath,, it adds so much! What a fun card! Congratulations on being featured in the Classroom! Ardyth your card is truly awesome. I love all of the colours and detail you have put into it, so worth it. A great tutorial. Totally worth all the tiny masking. Wow, so vibrant and cheery, beautiful card on EH! Wow! Gorgeous card; I just love the color scheme and design. Your card is so bright and fun! Looking forward to meeting you in October! Such a fun and festive Christmas card! I love how you used the wreath stamp to make that fabulous border. Your cards are always so beautiful. thanks for sharing. Ardyth, congratulations on being on The Classroom. An honour! You're in great company. I love this card. The bright non traditional colours, which I am fond of and that sentiment tag and where you placed it. Beautiful,cheerful,and full of JOY!I love the colors you used. I'm inspired to start on Christmas cards now! AWESOME card, I love how the background was made with the wreath stamp! Thanks for the heads up about Ellen H. 40% off sale! What a fun card. Love the non-traditional colors and the design. Such a great card!! Congrats and thanks for sharing!! Congrats, Ardyth, on being featured "In the Classroom". Love how you mixed all these stamps for a fun vibrant card. Always look forward to being inspired by you. Maybe if I start working on my Christmas cards now I will be ready by the time Christmas rolls around! Way to go on the GDT! You are awesome! Love this fun card! You're motivating me to keep going on my Christmas cards! Another extraordinary card! What a fun set of colors! Sooo happy to see you as a guest designer for EH. I love your modern Christmas card with all those fun colors! Hopping over to see the full details of your card now! Absolutely love everything about this card, Ardyth. Lovely card! I really like how the lights popped! Such a pretty and fun card Adryth. Love the background panel with the colorful bubbles... wow! the masking job is amazing! I love cutting, but those bulbs are tiny! Congrats on being featured on The Classroom, Ardyth! Your card is very pretty - I love the non traditional colors. And I can imagine you are still finding those tiny lightbulb masks! Love the bright colors! So pretty and fun for the holidays! Your card almost has a tropical Christmas feel. Love the color combination. True Ardyth style, happy bright and perfect! WOW, Ardyth, this is fabulous and can't believe your attention to detail, especially masking those lights. Awesome idea coloring partial wreaths for your border. That whimsical tree is such a fun look. Oh my gosh, your card is so cute. Thanks for sharing with us. WOW I absolutely LOVE your card!!! I have this stamp set and think I will give it a try:) Thanks for sharing!!! Love your card, Ardyth! You are always on inspiration. Thank you so much! Yay you!! How exciting and your card is spectacular!! Love the bright colours and the way you used the wreath to create the background pattern is genius! Congratulations! Your invitation to guest design for Ellen is well deserved recognition. Your talent for clean and graphic is unsurpassed... and your card is another I'll be CASEing! Love the color combo for a Christmas card! I just saw the link on Instagram and I'm off to check it out! Such a festive and fun card, Ardyth! Just love this cute tree. I just love your cards. This is an adorable holiday card that anyone would love to receive. This card is so cute and whimsical. Love it! Going to check it out! Thanks for the chance to win! Love the colors you've used! The colors are great! This is such a cute card. EH has become my go to place for supplies. I love their fast shipping and personal touches. Congrats on being in The Classroom!!! This card is gorgeous.....STUNNING!!! It definitely shows you deserve to be there😍!! Not much of a Christmas in July girl but if all the art I saw was like this ........I might just change my mind 😊. Thanks. I truly love that sweet Charlie Brown tree of Julie's. One of my favorites & your rendition is perfect. Always love your cards. Thanks for the inspiration! Such a fun card! Thanks so much for offering such a delightful prize! You are a woman of endless patience! But, as always, your diligence paid off into this stunningly creative card!!! I really love your color combo. Such a fun holiday card! I know this tree has a lot more green, but for some reason it makes me think so much of the Charlie Brown Christmas episode. I love it! Very fun image you used and awesome colours...really captures your attention. Well, as I've squealed, I love this card!!! You make such fun things, Ardyth! (in your sleep, I'm convinced!) So fun you are enabling one random winner!! :) Too kind! xo! Congrats on your achievement!!! And I LOVE this beautifully colored card! Where do you find the time Ardyth? All of your Christmas cards are lovely. They bring on that true Christmas feeling. As always, thank you for the inspiration! Awesome! Love the whimsical, modern feel!! Those lights on the tree are fabulous, Ardyth, but I can't imagine cutting the tiny masks. I think I would have used a liquid mask. I love the whimsical style and the colours. Love the bright colors for a bright holiday - what a lovely card!! Christmas card inspiration is coming early this year! Wow..awesome card..love it totally..Pink lights are looking so beautiful..
Apart from the overall wonderfulness of this card I LOVE the colours.